> The Gwinnett Gladiators of the ECHL have announced, today, the signing of goaltender Charlie Effinger. You can view the press release here. Charlie becomes the first goaltender signed by the Gladiators for the upcoming season. The 6-foot-1, 195-pound netminder posted a perfect 6-0-0 record during his senior season with the RedHawks. He finished the season with a 2.16 GAA and a .912 save percentage in 6 games while posting a 4-0-0 record during CCHA conference play. Effinger had a career year during his sophomore season appearing in 19 games and ranking first in the CCHA in both goals-against average (1.83) and save percentage (.931). He was also ranked second nationally in both categories. 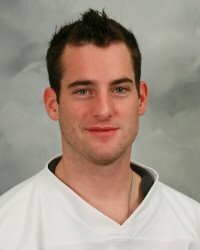 During his sophomore season in 2005-06, Effinger was named the CCHA’s best goaltender and was named to the All-CCHA Second Team while he was honored as Miami’s Scholar-Athlete of the Year. Effinger became the first RedHawks netminder to earn all-CCHA honors since the 1996-97 season when Trevor Prior, who played for Gwinnett during the 2003-04 season, earned all-CCHA honors. During his four-year collegiate career, Effinger appeared in 53 games with the RedHawks while posting a 32-12-4 record. He finished with a .912 save percentage and a 2.35 goals against average and two shutouts. 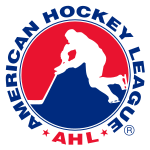 Gwinnett is the ECHL affiliate of the NHL’s Atlanta Thrashers. Best of luck to Charlie! 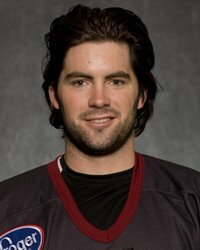 (Chatham, Ontario) was one of three 2008 Hobey Baker finalists and earned 2008 ACHA West All-America First Team honors. A three-time all-CCHA honoree, Jones earned first-team accolades in 2007-08. 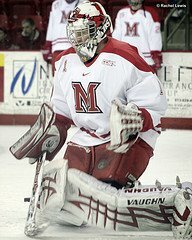 He captained the RedHawks to a school-record 33 victories during the 2007-08 campaign as Miami spent 10 weeks ranked No. 1. Jones finished the 2007-08 season with 31 goals, giving him 90 for his career and placing him second on the school’s all-time scoring list. His 31 goals ranked third nationally and was the first 30-goal season for a Miami player since 1992-93. Jones finished his collegiate career with 21 game-winning goals, tying him with two other players for the second-most game-winners in Division I history. Setting the program record for games played (161), Jones played in every game during his four-year Miami career and propelled the RedHawks to three NCAA Tournament appearances, a No. 1 regional seeding in the 2008 NCAA Tournament and a regular-season CCHA title in 2005-06. Additionally, Jones was named a National Strength and Conditioning All-American in 2008. 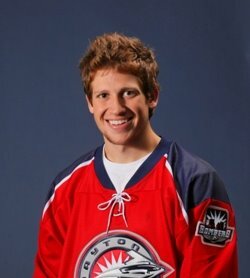 He is currently signed with the National Hockey League’s Nashville Predators. (Belleville, Ill.), who boasted a 3.51 GPA and majored in American studies and political science, was a part of three NCAA Tournament appearances, a No. 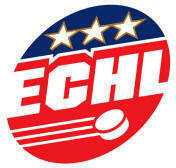 1 regional seeding in the 2008 NCAA Tournament and a regular-season CCHA title in 2005-06. In 2007-08, the RedHawks spent 10 weeks ranked No. 1 in the country and compiled a school-record 33 wins. Effinger–who was considered the consummate team player–was a 2008 Spirit of Miami Award recipient, presented to the male and female senior student-athletes whose playing time did not deter their enthusiastic commitment to their team. In 2007-08, Effinger appeared in eight games and amassed a perfect 6-0 record and finished his career with an impressive mark of 32-12-4. As a sophomore, Effinger was named the CCHA’s Best Goaltender and was a second-team all-CCHA selection, ranking first in the league and second nationally in goals-against average and save percentage. Congrats to both! Another example of how Miami University excels on the ice, in the classroom and in the community. 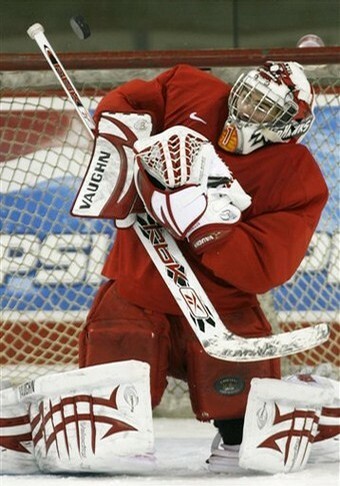 A nice writeup on former RedHawk goaltender Charlie Effinger can be found here. The Article talks about his expierience at the Blues development camp. It’s worth checking out! 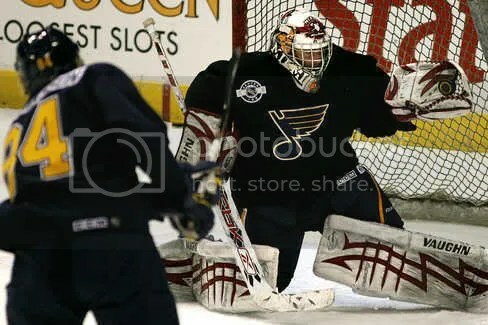 Former RedHawks goaltender Charlie Effinger (Class of ’08) has been invited to the St. Louis Blues development camp this week at the Scottrade Center in St. Louis. 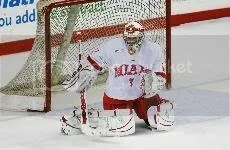 Effinger finished his Miami career with a record of 33-14-4. His best season came during the 2005-2006 campaign, when Effinger finished with a 12-4-3 record and a 1.83 GAA/.983 save percentage, good for second best nationally.